November 22nd, 2014 | Straub Park | 6:00 p.m. till 11:00 p.m. Experience The Circus You Never Did Before: Chillounge Night is teaming up with The Circus Arts Conservatory to bring Cirque du Chill – an epic and dynamic circus arts presentation. 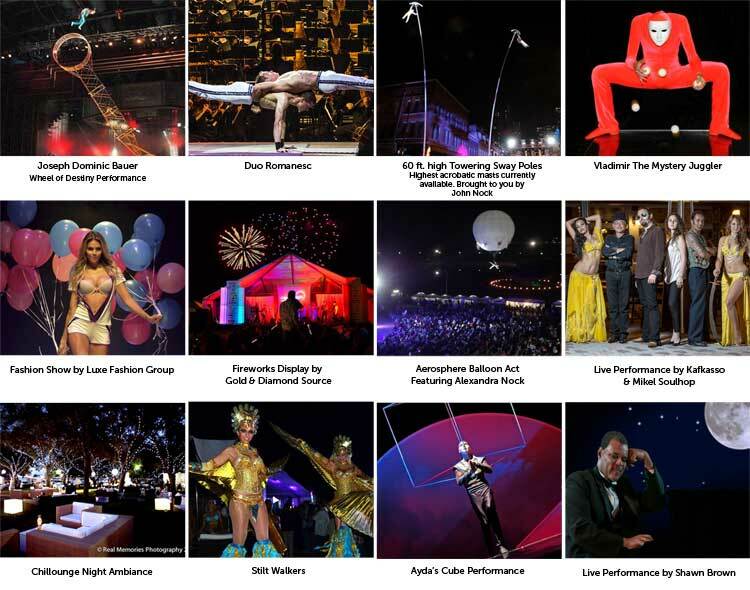 Cirque du Chill will feature spectacular entertainment by world-renowned circus artists that will be unlike any Chillounge Night experience yet to date. Benefiting Creative Clay and The Woodson Museum. The magnificent waterfront view of Straub Park will be the backdrop for the ultimate outdoor lounge party. Hundreds of chic daybeds, cabanas and outdoor furnishings will transform the area into a cozy and comfortable setting for thousands to enjoy a festive evening of food, drink and entertainment. Other highlights of the evening are: Live entertainment by Kafkasso, The Shawn Brown Band and Mikel Soulhop. Dazzling Runway Fashion Show organized and presented by Dona Crowley with Luxe Fashion Group and a beautiful fireworks display, once again presented by Gold & Diamond Source, will highlight the skies. National Anthem by Tina Pepin. DJ Fresh will DJ throughout the event. To the elegant outdoor lounge party is $30 per person at the door (must be 21 or older). Advance tickets are on sale for $25. The VIP Lounge is an exclusive roped-off section, and tickets are available for $100. Special Cirque du Chill performances only in VIP area will make the VIP experience a night to remember. Includes complimentary food and beverages. Parkshore Grill and 400 Beach Seafood & Tap House will provide al fresco dining offering signature items cooked on-site. They will also offer a wonderful selection of food for sale to the general public throughout the night.